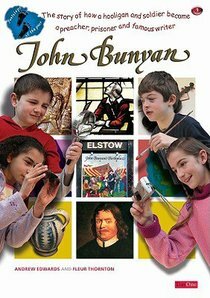 This large booklet aims to tell younger readers some of the facts about the real John Bunyan and some of the stories from his past. Read about his mistakes and about how he kept being thrown into prisonand how he was determined to tell people about God no matter what it cost. Alongside the story which includes several illustrations there are also some great activities to have fun with. These include Wordsearches to do; Puzzles to work out; Games and activities to enjoy; Things to find out. - Publisher Find out about Bunyan: Word-searches to do; Puzzles to work out; Games and activities to enjoy; Things to find out, and much more! About "John Bunyan (Footsteps Of The Past Series)"
Find out about Bunyan: Word-searches to do; Puzzles to work out; Games and activities to enjoy; Things to find out, and much more!